Road infrastructure development in South Africa contributes to the nation’s economic and social wellbeing by unlocking land for new investment and development, creating jobs and improving access to urban amenities and opportunities. 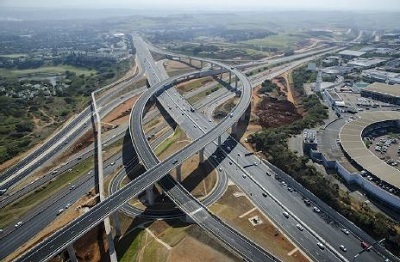 Taking place hand-in-hand with other development, the effects are extremely powerful as seen at the new N2 interchange. Part of a much needed third wave of development, this stretch of road between Isipingo in the south and eMdloti in the north was initially built in 1978 to provide much needed relief to motorists travelling in a north / south direction. The second wave came in the late 90s with an upgrade to the N2/M41 interchange, the M41 and new exits into the uMhlanga Precinct with the construction of Gateway Theatre of Shopping. Now 40 years since the initial build, the third wave, undertaken by the South African National Roads Agency SOC Limited (SANRAL), the KwaZulu-Natal Department of Transport and eThekwini Municipality, the R1 billion interchange is nearly complete. According to SANRAL Eastern Region project manager, Corné Roux, an estimated 40 000 vehicles enter or leave the N2 from the M41 daily. “Due to the expansion of the uMhlanga and La Lucia areas, the previous interchange was operating at capacity with vehicles backing up on the M41 and onto the N2 in peak hours. This, together with expected future expansions and anticipated development in the Cornubia area, required the existing interchange to be upgraded to improve flow to and from the N2 and M41 to the supporting road network,” he said. The new interchange features a multi-stack bridge (one of South Africa’s biggest structures) and four levels with no signalisation. Soaring to giddying heights, the interchange is nothing short of impressive and is designed to provide non-stop access to the Verulam, Phoenix, Mount Edgecombe, uMhlanga Ridge Town Centre and the KwaZulu-Natal North Coast. Construction commenced in April 2013 and work is due for final completion in mid-October 2018. Roux says the biggest challenge was accommodating traffic in all directions during construction. “The interchange sits on a major national road, the N2, and the M41 feeds major residential, industrial and commercial areas such as Phoenix, Mt Edgecombe and uMhlanga carrying high volumes of traffic which had to be kept moving during the interchange’s construction. Another challenge were the ground conditions that required the installation of extensive piling to support the interchange structures,” says Roux. Despite the lengthy construction period and disruptions on this busy stretch of road, motorists are now feeling the benefits of the interchange which has dramatically improved traffic flow through the area. State-of-the-art lighting makes the intersection safer and more visible at night and the pedestrian bridge also makes it safer and more convenient for people to cross the N2. “The Mount Edgecombe Interchange is now a landmark structure and a vital artery of the greater eThekwini metropolitan highway system for easing traffic, relieving congestion and is also a significant business enabler,” concludes Roux. Caption: Years in the making: The construction of the N2/M41 Interchange which features a multi-stack bridge and four levels with no signalisation, is due for completion mid-October 2018. The mammoth project, which commenced in April 2013, will have a positive impact on this area’s urban quality and spatial connectivity. Image Credit: Tongaat Hulett Developments. 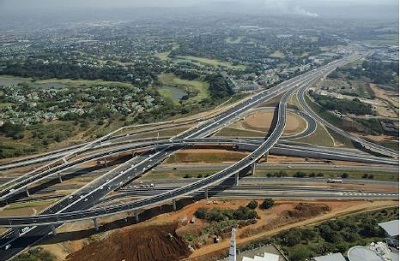 Caption: Connectiong communities: The N2/M41 Interchnage at uMhlanga, is designed to provide convenient access to Verulam, Phoenix, Mount Edgecombe, uMhlanga Ridge Town Centre and the KwaZulu-Natal North Coast. Image Credit: Tongaat Hulett Developments. Tongaat Hulett is an agriculture and agri-processing business, focusing on the complementary feedstocks of sugarcane and maize. Its on-going activities in agriculture have resulted in the company having a substantial land portfolio within the primary growth corridors of KwaZulu-Natal with strong policy support for conversion at the appropriate time. Tongaat Hulett strives to be a proactive and resilient organisation working in collaboration with all its stakeholders through different business and agricultural cycles in a constructive, mutual value-adding and developmental manner. It has operations in six countries in SADC, significant sugarcane and maize processing facilities, a unique land conversion platform, a sizeable animal feeds thrust and possibilities to grow ethanol and electricity generation.